The Ancient Egyptian Deities are here to assist you! 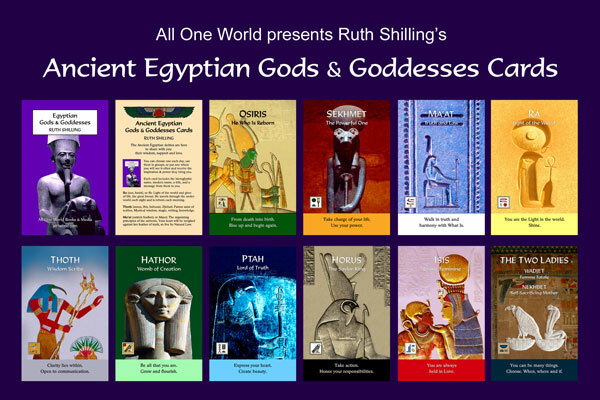 The Egyptian Gods & Goddesses Cards give you ways to connect with the power, guidance, and love these deities can bring to you. You can choose a card each day, use them in groups, or put one where you will be inspired when you see it. • A message for you from that god or goddess. These messages reflect their sphere of influence, areas in which they can be helpful to you. Each Set includes 10 deity cards, plus 1 Explainer Card. The reverse of each card is pictured below. Card size: 3 1/2 X 5 1/2 inches with rounded corners. Explainer Card includes descriptions of each deity. Ra, Thoth, Ma’at, Sekhmet, Ptah, Osiris, Isis, Horus, Hathor, The Two Ladies-Nekhbet & Wadjet. Includes shipping within the US. Discounts for larger orders. Card size: 3 1/2 X 5 1/2 inches with rounded corners. Laminated and sturdy. 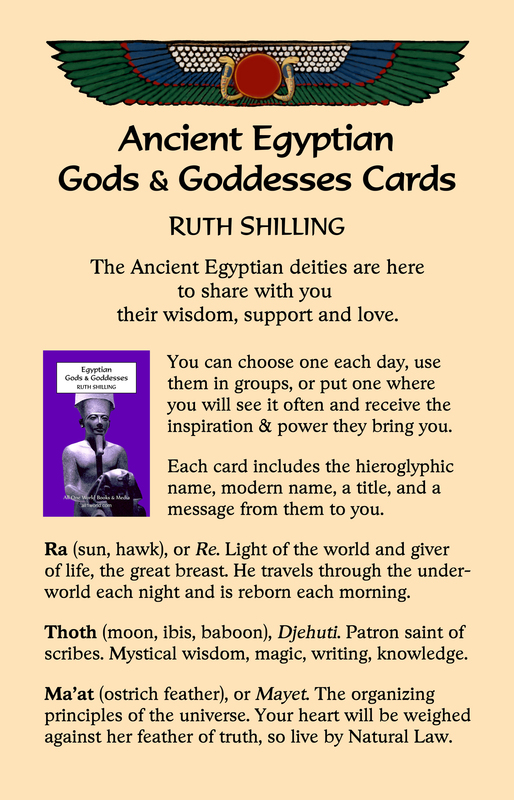 Deity Cards in each set: Ra, Thoth, Ma’at, Sekhmet, Ptah, Osiris, Isis, Horus, Hathor, The Two Ladies-Nekhbet & Wadjet.